OSWEGO – The Oswego Fire Department was dispatched to a reported structure fire with trapped occupants at 8:16 a.m. today (July 31) at 69 E. Cayuga St. Upon arrival, OFD command reported heavy fire conditions in the front of the two-story multiple-occupancy and confirmed victims in a second story window. Power lines were dropping in front of the residence as crews arrived. Truck company firefighters quickly placed a ladder at the second story window and were able to remove a 4-month-old boy, a 7-year-old girl and an adult male to safety. Engine company personnel worked to knock down the fire in the front of the residence and the main ambulance crew geared up and entered the rear of the structure to conduct a primary search where they rescued a dog to safety. A second dog was rescued from the upstairs apartment. All of the fire victims were checked and released at the scene. “The home did have working smoke alarms, but at this time we are unsure how many and their locations,” Fire Chief Jeff McCrobie said. Residents and property owners are reminded that smoke alarms should be installed inside of every bedroom, outside of every sleeping area, and on every level of the home. OFD crews were assisted at the scene by the Oswego Police Department, Menter Ambulance, National Grid, Oswego County Fire Coordinator’s Office, Oswego DPW, and Oswego Traffic Department. Although today’s fire caused significant damage to the home, there were no injuries, the chief noted. The American Red Cross is working to assist the displaced occupants at this time. “I would like to commend our crews for a fantastic effort today, as always, in preserving life and property,” Chief McCroie said. But what is the house’s address? Lots of fires lately…wouldn’t have anything to do with the water/sewer rates by chance would it? Hmmm. No Robert, but I get your point. It has more to do with the older structures in many cases, and other things like strong wind conditions from the lake that make a lot of the fires worse than they would be. 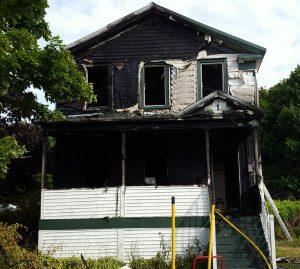 No doubt, Oswego has had an abnormal amount of fires throughout the years in its history, and certainly some questionable ones. Kudos to the all of the responders, homes and personal items can be replaced yet again you have proven the value of having those that “run in without question”.